New England Angus Breeders are looking for expressions of interest to take over their site at AgQuip. 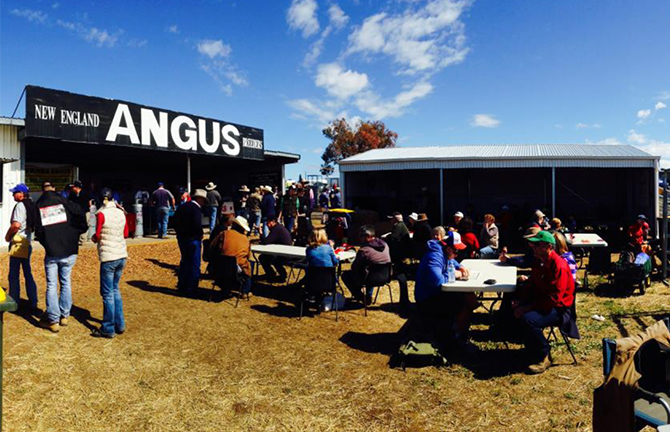 New England Angus Breeders have promoted the Angus Breed at AgQuip for over 20 years – it has been a location for people to catch up, talk all things Angus and have the best steak on the site. Ideally, the group would like this to continue and are therefore accepting expressions of interest from parties who may be interested in taking over this site. Large three-sided-shed with enclosed secure room at one end. This shed has a cement floor. There is a water tank with running water to three locations, gas hot water system, two-bowl kitchen sink area plus separate handwashing basin. There is a front counter area with cash till drawer. There is also a separate drink counter area which can be located at any part of the shed if required and a large array of tables, chairs, bbq’s and gas urn. There is a smaller three-sided-shed which has been used as an undercover dining area. An annual site rental is paid to Fairfax Rural Events including electricity. Anyone who is interested in discussing costs or options with regard to taking over this iconic site please contact New England Angus breeders; preferably no later than January 30, 2017. This year’s AgQuip will be held on August 22, 23, 24, 2017.